8th July 2015: You may remember the swing foursome Jack Pack from Britain’s Got Talent last year (they got through to the final don’t you know?). Singing a plethora of swing classics such as Mac the Knife, Bad, New York, New York, and a cover of One Direction’s Story Of My Life there was something to sing along to for everyone and some good harmonies. A live swing band would have been a bonus though! A special mention goes to the group’s interpretation of Forever, written by Randy Newman (You’ve Got a Friend in Me) which can be found on their debut album ‘Jack Pack’. The entertainment was added to with gaggle of screaming pre-teens, declaring their undying love for baby-faced Alfie Palmer. Despite the distraction the guys held it together and I’m sure there is more to come. 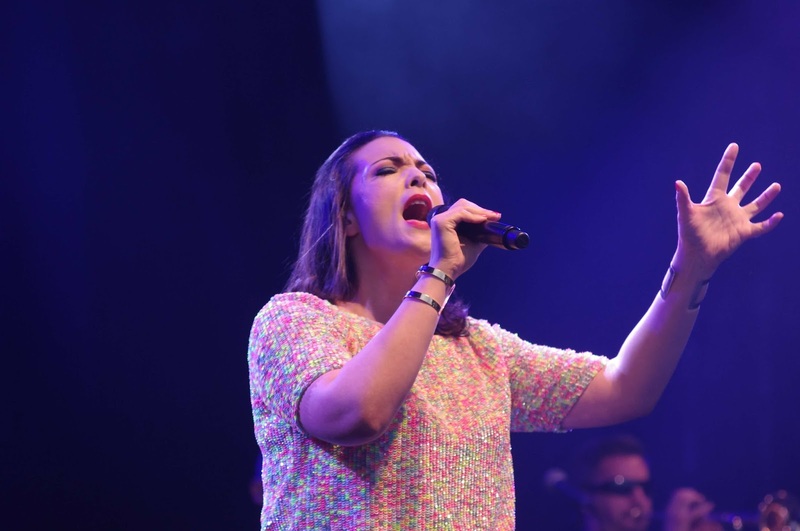 Caro Emerald headlined day two of the ‘Kew the Music’ festival, bringing her pop-vintage vibe and band of talented musicians to the leafy surroundings and picnicking prosecco-drinkers of Kew Gardens. Having been busy in the studio, recording for her new album (due to be released later this year), Caro returns with a host of original jazzy tunes and world beats including Just One Dance, Tangled Up and Back it Up complete with audience participation. Her April-released single Quicksand with its more commercial pop influences is a catchy little song that leaves one wondering what little gem is in the pipeline for Caro and her band. Speaking of the band, what a talented bunch they are, especially Ben Cummings on the trumpet, and a keyboard player whose equipment fell off it's stands at the end of the show from his frantic keyboard solo! So whether it's a Liquid Lunch or a picnic in the park, Caro goes to prove that On A Night Like This she is in a class of her own!